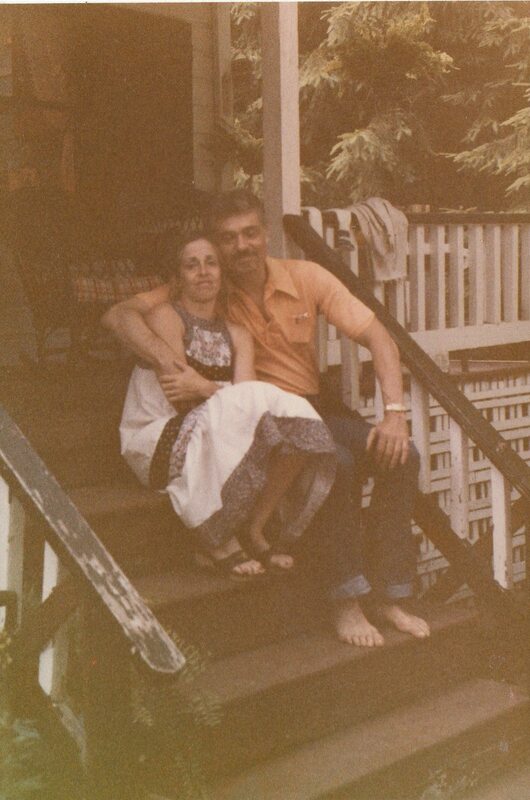 My Mom passed away early the morning of Friday, July 19, 2013. Although it was not unexpected, when the news came it hit hard. 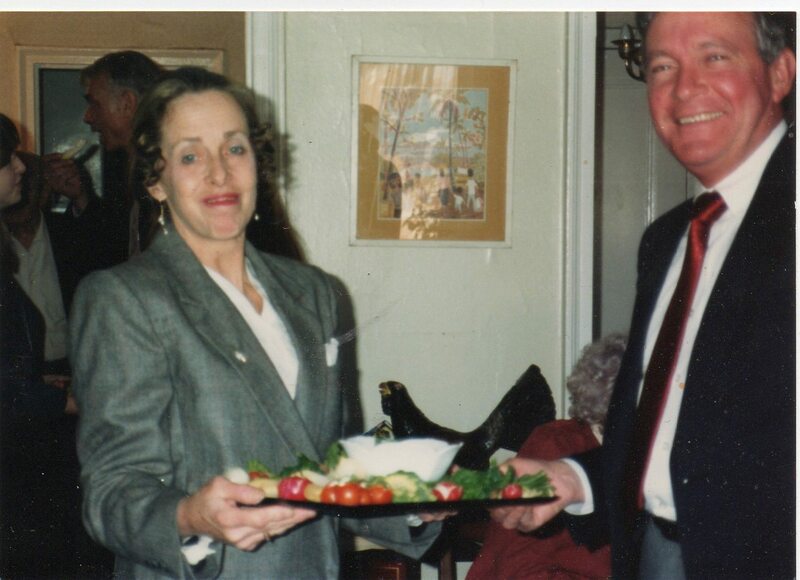 My dad, my brothers, my sister and Florian--none of us could really imagine life without my mom's irreverent sense of humor, her unconditional support, her overwhelmingly generous love and her uninhibited affection. So we told ourselves that she was doing well, and in some ways she was--right until the end. 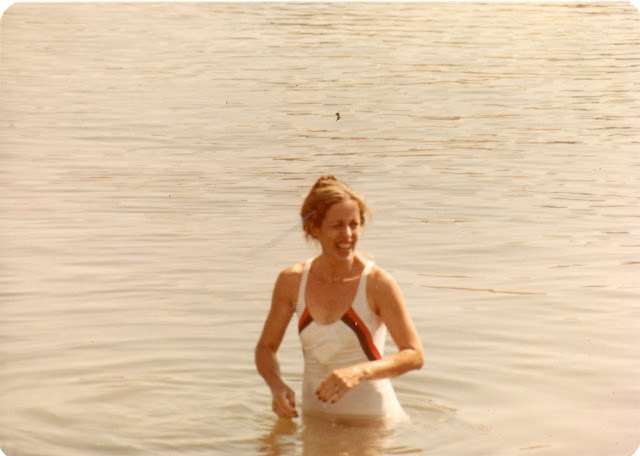 Right up until the end, my mom embodied vibrant joy, intense love, and razor-sharp intelligence that made it easy to hold on to the hope that she would hold on. My mom could bring out in me a feeling of wild, raucous joy blasting out in all directions. I don't think I know anyone who is so completely, thoroughly loving, who lived so completely for the sake of giving. Maybe that is why she brought out in me a sensation of being thoroughly, joyously alive and a compulsion to sing, skip, and clap my hands. I do believe that there is a current of joy running through the universe, and I think the love I felt with my Mom set me free to tap into it. 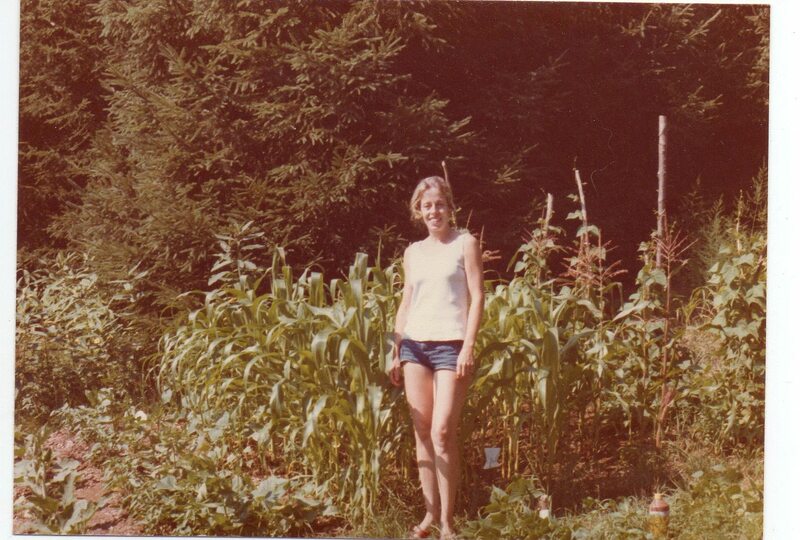 I think her extraordinary love for animals, for her family, for plants and her garden and kids and babies and the world, just made it OK to be who I was, uninhibited. I think that maybe the natural state of things is for people to go around singing and skipping and clapping their hands and saying HI MUM HI MUM HI MUM HI MUM HI MUM, and my mom's acceptance and love and bemused, exasperated acceptance made it OK to lapse into that natural state of things. I know that I owe some essential things to my Mom. My love of nature, and my feeling of kinship with trees and plants and green things that grow. My love of animals, and my propensity to talk with them as if they understand every word. My belief that derision is the surest sign of affection. And there are other things that I will never be able to do like my Mom did. the Christmas angels and ornaments, the beautiful drawings that decorated every card she sent. I am still not sure how to go on without all that. 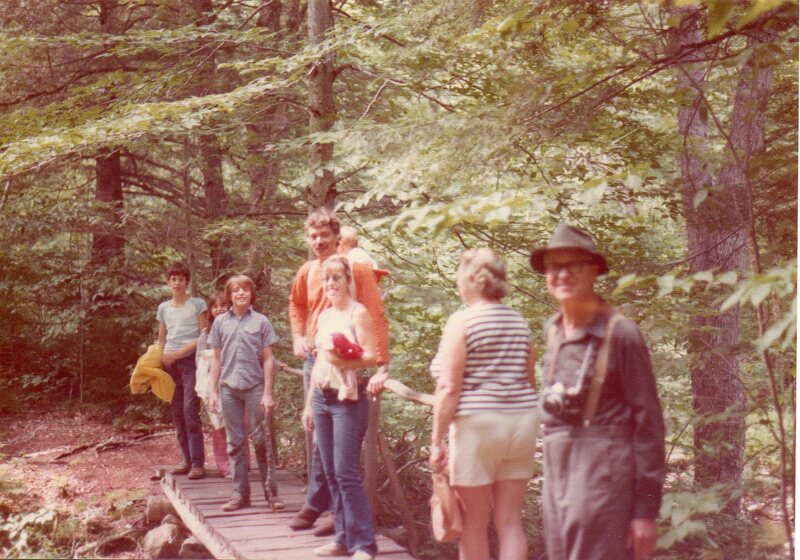 I guess you do it by being thankful for what we had, like that one week in the Adirondacks just two weeks before she died, when she got to be in the only place she wanted to be. I am so glad I spent time with her just sitting in her garden, sitting at the kitchen table, going for short walks, driving and talking. And I guess you do it by keeping alive all the things she represented, the irreverence, the humor, the love of family and animals and nature, and the wild, unfettered, ridiculous blast of joy. 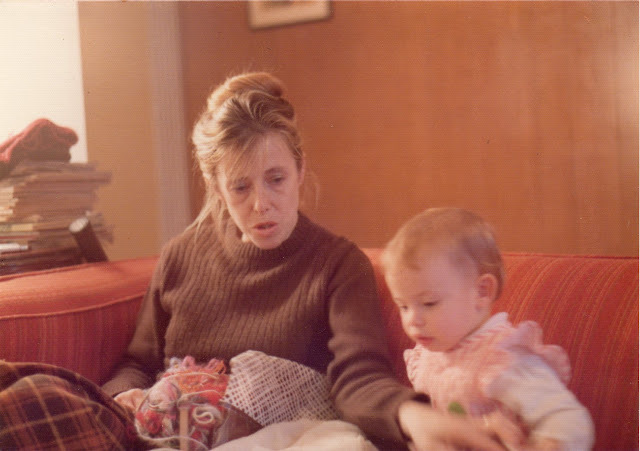 My Mom was this blog's most devoted reader, and she loved it when I wrote a post that celebrated her and celebrated our family. She was moved when my blog friends said nice things in response to my posts about her and about my childhood. 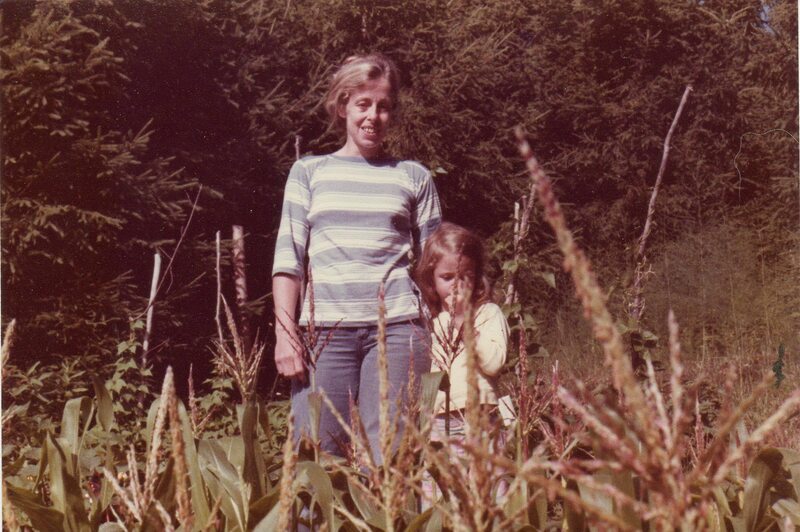 My Mom sometimes felt unappreciated, and those posts were a way to try to fix that. My family has started a blog devoted entirely to her life, where my sister, my aunt, and others will post our stories, memories, and celebrations of my Mom. 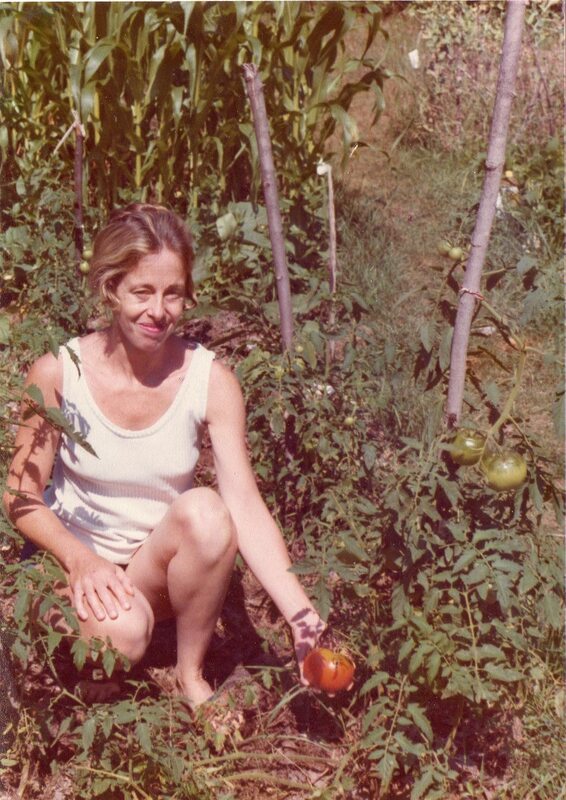 Mom, we will miss having you here with us but will think of you as a bright stream of laughter coursing through the universe, a blast of energy bringing your vitality to all living things and nourishing gardens of green growing life as you did when you were here. Hi Kristen, that is a great tribute. It made my dad choke a bit on his bagel. It's the kind of like you're reading along and all of a sudden, wham - it hits you and stuff happens. You're mom must be very proud that she did such a great job raising you. May be the world is a better place after all. We'll leave our porch light on tonight for your mom. This is such a beautiful, well-written tribute. I am so, so sorry to hear about this. I am so deeply sorry to learn about your mother's passing. You are an incredible daughter who obviously takes after her. Your Mom looks like she was a "free spirit" before it was "hip" to be so. How beautiful she was as well. You look so much like her, she must have been so proud. She is smiling down from Heaven reading this beautiful post. She was one in a million and so are you! What a lovely tribute, Kirsten. 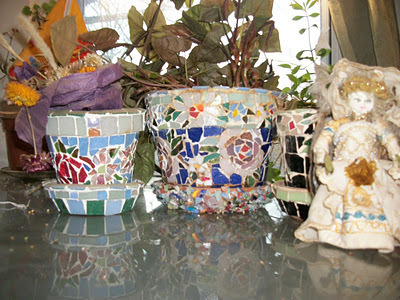 It's obvious that you've inherited your mother's creativity and flair for living. Thank you so much for sharing your family with us. 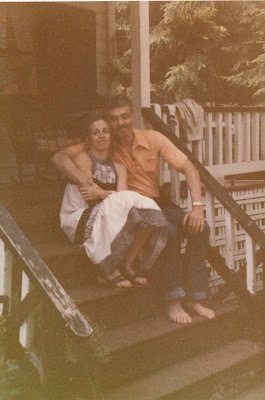 I hope you all enjoy sharing your memories together on the new blog. It's a lovely idea. I'm so terrible sorry you lost your mom and what a fantastic tribute this post is. 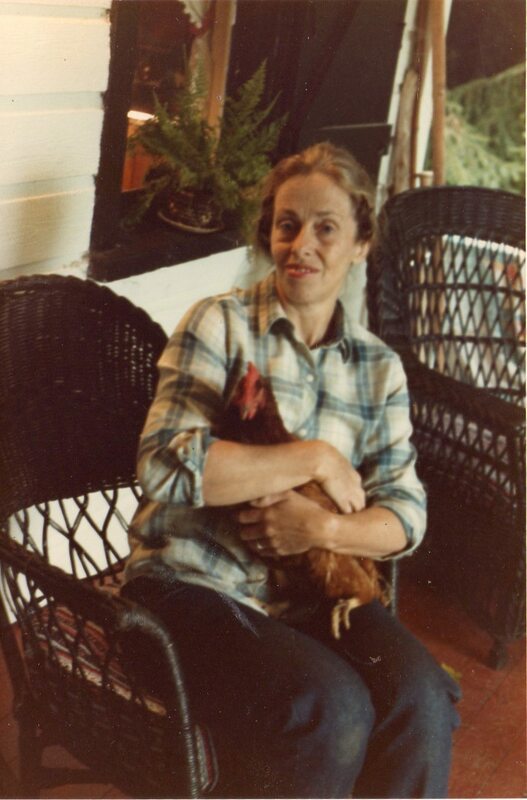 The picture of your mom holding a rooster really illustrates how much she loved all critters. Sending lots of virtual hugs to you and your family. I'm so very sorry for your incredible loss. She sounds like an amazing woman, friend and mother. Hugs!! Your mom sounded like a beautiful woman inside and out. It must be such a difficult time for you and your family but it's so wonderful that you will keep her memories alive. Your Mum was a gift and a treasure to be cherished, which you did and still do Kirsten. You always will. So very sorry she has left you. What a wonderful legacy she has left in you though. You've written a beautiful tribute to an amazing lady and I'm sure her blog will be very precious to your family. That is a beautiful tribute to your Mom. Sorry for your loss. I am so sorry to hear this. She sounded like a wonderful person, and her beauty is reflected in you. Wishing you peace and comfort as you remember the joy of her life. I'm broken-hearted for you. I can't imagine a bigger loss than the loss of a mother. This post is so perfect. For a daughter to be able to write such a clear, loving, moving, heartfelt message like this...that says it all. My deepest, deepest sympathy to you and to your whole family. It is indeed a beautiful tribute. What a gift she gave you! So glad you and Florian had that special time with her. A wonderful tribute to your mother. I am sure she is smiling as she reads along. My thoughts are with you. I love your vision of your mom as a stream of laughter throughout the universe - an obviously wonderful woman. I'm so sorry for your loss but am glad she was "well" almost to the end. When my mom actually realized she was imminently dying, she told my sister, "If I'd know it would be this fast, I wouldn't have ordered the carrots." Thank you for sharing your life and family with us in the blogosphere. Sweetie, I'm so sorry to hear about the loss of your mom. I lost mine several years ago, and I know firsthand how hard it is. ((hugs)) This post is a beautiful tribute to her - as are you, the wonderful woman that she raised. I see so much of you in the photos of your mom that you posted. The new blog is a wonderful idea. What a beautiful tribute to your mom. I'm sure she knows how much you'll miss her - and I'm sure she was very proud of you and her entire family. I don't think I know anyone who is so completely, thoroughly loving, who lived so completely for the sake of giving. <-- You do know that you also just described yourself, right? Dear Kirsten, I'm sorry to be reading this so late. 1 and a half months have passed now. I know you will always feel the loss, but I hope your heart is a little less painful. 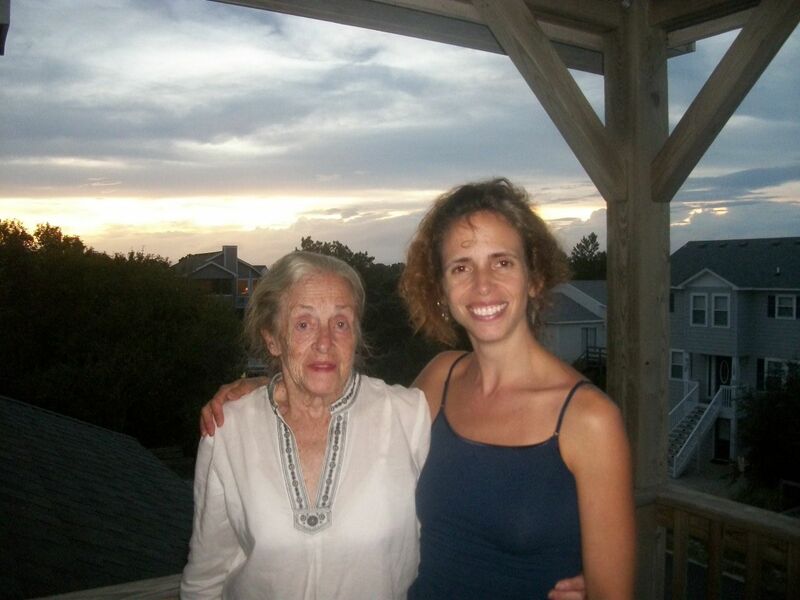 The family blog is a brilliant idea and a wonderful celebration of your mom's life and stories.